Tohno Takaki and Shinohara Akari are two classmates in an elementary school. During their time together they have become close friends. Their relationship is tested when Akari transfers to another city because of her parents' jobs. Both of them struggle to keep their friendship alive as time and distance slowly pulls them apart. When Takaki finds out that he is moving farther away, he decides to visit Akari one last time. 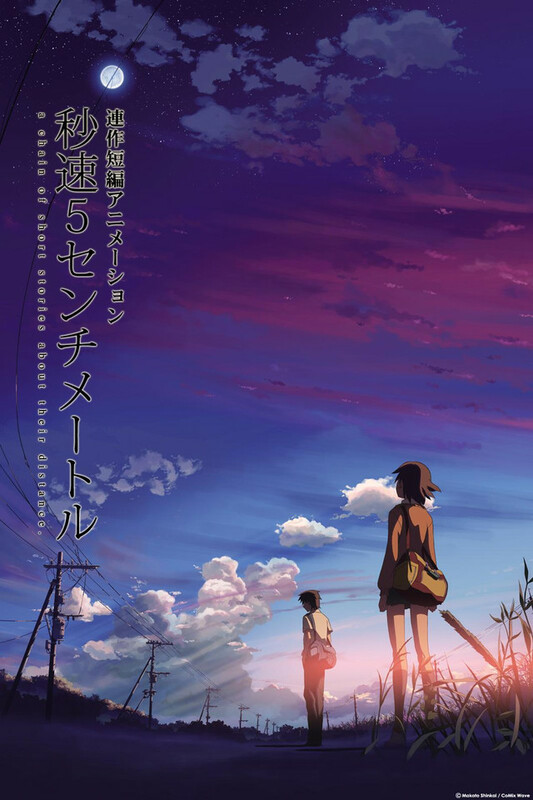 Beginning with the lyrical image of cherry blossoms falling at five centimeters a second, Makoto Shinkai paints a breathtaking vivid tableau of young love, desire, loss, and hope. Told in three heartbreaking chapters, we follow the young dreamer Takaki through his life as cruel winters, cold technology, silence, and, finally, adult obligations and responsibility converge to crush the delicate petals of true love. Finding beauty in everyday objects and moments, Shinkai reveals he is a master of animation and haunting, beautiful storytelling. Fall in love with this gorgeous, thoughtful film, hailed by critics and audiences alike for its beauty, truth, and innovation in animation.